I will tell you a story about the Reciprocity Law. After my thesis, I had the idea to define -series for non-abelian extensions. But for them to agree with the -series for abelian extensions, a certain isomorphism had to be true. I could show it implied all the standard reciprocity laws. So I called it the General Reciprocity Law and tried to prove it but couldn’t, even after many tries. Then I showed it to the other number theorists, but they all laughed at it, and I remember Hasse in particular telling me it couldn’t possibly be true. Still, I kept at it, but nothing I tried worked. Not a week went by — for three years! — that I did not try to prove the Reciprocity Law. It was discouraging, and meanwhile I turned to other things. Then one afternoon I had nothing special to do, so I said, `Well, I try to prove the Reciprocity Law again.’ So I went out and sat down in the garden. You see, from the very beginning I had the idea to use the cyclotomic fields, but they never worked, and now I suddenly saw that all this time I had been using them in the wrong way — and in half an hour I had it. Algebraic number theory assumed (e.g. the ANT chapters of Napkin). In this post, I’m going to state some big theorems of global class field theory and use them to deduce the Kronecker-Weber plus Hilbert class fields. For experts: this is global class field theory, without ideles. Here’s the executive summary: let be a number field. Then all abelian extensions can be understood using solely information intrinsic to : namely, the ray class groups (generalizing ideal class groups). pairs of conjugate complex embeddings. Hence . The first class of embeddings form the real infinite primes, while the complex infinite primes are the second type. We say is totally real (resp totally complex) if all its infinite primes are real (resp complex). has a single real infinite prime. We often write it as . has a single complex infinite prime, and no real infinite primes. Hence totally complex. has two real infinite primes, and no complex infinite primes. Hence totally real. The motivation from this actually comes from the theory of valuations. Every prime corresponds exactly to a valuation; the infinite primes correspond to the Archimedean valuations while the finite primes correspond to the non-Archimedean valuations. for any real prime . Obviously, every can be written as by separating the finite from the (real) infinite primes. If is a finite prime, then means exactly what you think it should mean: . If is a real infinite prime , then means that . Let be a modulus of a number field . Let to be the set of all fractional ideals of which are relatively prime to , which is an abelian group. This is sometimes called a “ray” of principal ideals. Finally define the ray class group of to be . This group is known to always be finite. Note the usual class group is . Thus is a group which contains a lattice of various quotients , where is a congruence subgroup. This definition takes a while to get used to, so here are examples. If we take then is all fractional ideals, and is all principal fractional ideals. Their quotient is the usual class group of , which is trivial. At first glance you might think this was , but the same behavior with ideals shows in fact . So in this case, still has all principal fractional ideals. Therefore, is still trivial. with the bijection given by . I want to emphasize that everything above is intrinsic to a particular number field . After this point we are going to consider extensions but it is important to keep in mind the distinction that the concept of modulus and ray class group are objects defined solely from rather than the above . commutes. Hence like before, each infinite prime of has infinite primes of which lie above it. For a real prime of , any of the resulting above it are complex, we say that the prime ramifies in the extension . Otherwise it is unramified in . An infinite prime of is always unramified in . 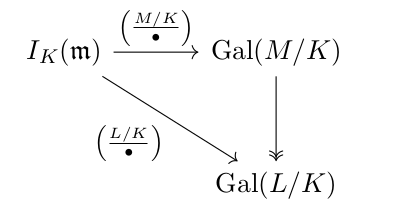 In this way, we can talk about an unramified Galois extension : it is one where all primes (finite or infinite) are unramified. Let be the real infinite prime of . Note also that if is totally complex then any extension is unramified. Let , . We have . From this we see that is the identity when and is complex conjugation when . In particular, if and only if splits completely in . Proof: We want to understand the order of the map on the field . But the latter is isomorphic to the splitting field of in , by Galois theory of finite fields. Hence the order is . Deduce from this that the rational primes which split completely in are exactly those with . Here is an th root of unity. Thus is determined by its underlying up to conjugation. In class field theory, we are interested in abelian extensions, (which just means that is Galois) in which case the theory becomes extra nice: the conjugacy classes have size one. Assume is an abelian extension. Then for a given unramified prime in , the element doesn’t depend on the choice of . We denote the resulting by the Artin symbol. where is the usual Legendre symbol, and is above in . Thus the Artin symbol generalizes the quadratic Legendre symbol. where is above in . Now, we further capitalize on the fact that is abelian. For brevity, in what follows let denote the primes of (either finite or infinite) which ramify in . This is called the Artin map, and it is surjective (for example by Chebotarev Density). 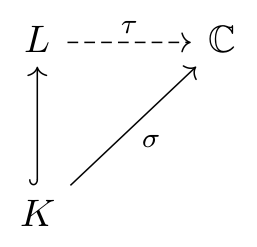 We can now present the long-awaited Artin reciprocity theorem. We call the conductor of . So the conductor plays a similar role to the discriminant (divisible by exactly the primes which ramify), and when is divisible by the conductor, is a congruence subgroup. More generally, we see that is always a subgroup some subgroup . This is the generic example of achieving the lower bound in Artin reciprocity. It also implies that . So we see that the kernel of this map is trivial, i.e.\ it is given by the identity of the Galois group, corresponding to Then for a unique abelian extension . commutes, because it suffices to verify this for prime powers, which is just saying that Frobenius elements behave well with respect to restriction. Then the inclusion of kernels follows directly. The reverse direction is essentially the Takagi existence theorem. Note that we can always take to be the product of conductors here. With all this theory we can deduce the following two results. Let be an abelian extension of . Then is contained in a cyclic extension where is an th root of unity (for some ). So by inclusion reversal we’re done. is the maximal such extension by inclusion. is isomorphic to the class group of . A prime of splits completely in if and only if it is principal. We call the Hilbert class field of . To see it is maximal by inclusion, note that any other extension with this property has conductor (no primes divide the conductor), and then we have , so inclusion reversal gives . We have the class group. The isomorphism in the previous part is given by the Artin symbol. So splits completely if and only if if and only if is principal (trivial in ). One can also derive quadratic and cubic reciprocity from Artin reciprocity; see this link for QR and this link for CR. There are some notes on valuations from the first lecture of Math 223a at Harvard. Most importantly: there should exist a real constant , such that whenever . The third property is the interesting one. Note in particular it can be rewritten as . Note that we can recover immediately. Similarly, the usual -adic evaluation, , which sends to . Here is a valid constant. We say (i.e. two valuations on a field are equivalent) if there exists a constant so that for every . In particular, for any valuation we can force to hold by taking an equivalent valuation to a sufficient power. In a valuation with , the triangle inequality holds. If for some , then . In particular, on any finite field the only valuation is the trivial one which sends to and all elements to . across all , . One can check that the same valuation gives rise to the same topological spaces, so it is fine to assume as discussed earlier; thus, in fact we can make into a metric space, with the valuation as the metric. Let be a field with a valuation. Viewing as a metric space, it is in fact a topological field, meaning addition and multiplication are continuous. If two valuations and give the same topology, then they are in fact equivalent. Proof: Again, we may safely assume that both satisfy the triangle inequality. Next, observe that (according to the metric) and by taking reciprocals, . so it equals a fixed constant as desired. We say a valuation is discrete if its image around is discrete, meaning that if for some real . This is equivalent to requiring that is a discrete subgroup of the real numbers. Thus, the real valuation (absolute value) isn’t discrete, while the -adic one is. A valuation is non-Archimedian if we can take in our requirement that . Otherwise we say the valuation is Archimedian. Thus the real valuation is Archimedian while the -adic valuation is non-Archimedian. Given a non-Archimedian valuation , we have . which is an ideal. In fact it is maximal, because is the set of units in , and is thus necessarily a field. Two valuations are equal if they give the same ring (as sets, not just up to isomorphism). Proof: If the valuations are equivalent it’s trivial. For the interesting converse direction (they have the same ring), the datum of the ring lets us detect whether by simply checking whether . Hence same topology, hence same valuation. is Archimedian if for every . In particular, any field of finite characteristic in fact has and thus all valuations are non-Archimedian. We say that a field is complete with respect to a valuation if it is complete in the topological sense. Every field is with a valuation can be embedded into a complete field in a way which respects the valuation. Given and its completion we use the same notation for the valuations of both. A valuation on is non-Archimedian if and only if the valuation is non-Archimedian on . Proof: We saw non-Archimedian for every . Assume is non-Archimedian on and hence . Then the set of values achieved by coincides for and , i.e. .
Not true for Archimedian valuations; consider . Proof: Assume ; then there is an such that since is dense in . Then, which implies . This means that distinct valuations are as different as possible; for example, if then we might get, say, a diagonal in which is as far from dense as one can imagine. Another way to think of this is that this is an analogue of the Chinese Remainder Theorem. Hence for any point we can take the image of . So it would follow that the image is dense. Now, to construct the we proceed inductively. We first prove the result for . Since the topologies are different, we exhibit , such that and , and pick . Here I talk about my first project at the Emory REU. Prerequisites for this post: some familiarity with number fields. How many primes are there with this property? What’s the least prime with this property? As an example, consider an arithmetic progression , , \dots, with and . The strong form of Dirichlet’s Theorem tells us that basically, the number of primes is the total number of primes. Moreover, the celebrated Linnik’s Theorem tells us that the first prime is for a fixed , with record . Introducing Dirichlet characters , which are periodic functions modulo . One uses this to get the mod into the problem. Introducing an -function attached to . Using complex analysis (Cauchy’s Residue Theorem) to boil the proof down to properties of the zeros of . With that said, we now move to the object of interest: elliptic curves. where the right-hand side has three distinct complex roots (viewed as a polynomial in ). If we are unlucky enough that the right-hand side has a double root, then the curve ceases to bear the name “elliptic curve” and instead becomes singular. Here’s a natural number theoretic question: for any rational prime , how many solutions does have modulo ? To answer this it’s helpful to be able to think over an arbitrary field . While we’ve written our elliptic curve as a curve over , we could just as well regard it as a curve over , or as a curve over . Even better, since we’re interested in counting solutions modulo , we can regard this as a curve over . To make this clear, we will use the notation to signal that we are thinking of our elliptic curve over the field . Also, we write to denote the number of points of the elliptic curve over (usually when is a finite field). Thus, the question boils down to computing . Anyways, the question above is given by the famous Hasse bound, and in fact it works over any number field! Here is the field of elements. The extra “ ” comes from a point at infinity when you complete the elliptic curve in the projective plane. Here, the ramification means what you might guess. Associated to every elliptic curve over is a conductor , and a prime is ramified if it divides . The finitely many ramified primes are the “bad” primes for which something breaks down when we take modulo (for example, perhaps the curve becomes singular). In other words, for the case, except for finitely many bad primes , the number of solutions is , and we even know the implied -constant to be . Now, how do we predict the error term? CM curves are “special cases”, in the sense that a randomly selected elliptic curve won’t have CM. It’s not easy in general to tell whether a given elliptic curve has CM. In other words, is distributed according to the measure . Now, what about the CM case? Consider an elliptic curve but regard it as a curve over . It’s well known that elliptic curves happen to have a group law: given two points on an elliptic curve, you can add them to get a third point. (If you’re not familiar with this, Wikipedia has a nice explanation). So elliptic curves have more structure than just their set of points: they form an abelian group; when written in Weirerstrass form, the identity is the point at infinity. Letting be the associated abelian group, we can look at the endomorphisms of (that is, homomorphisms ). These form a ring, which we denote . An example of such an endomorphism is for an integer (meaning , times). In this way, we see that . Most of the time we in fact have . But on occasion, we will find that is congruent to , the ring of integers of a number field . This is called complex multiplication by . Intuitively, this CM is special (despite being rare), because it means that the group structure associated to has a richer set of symmetry. For CM curves over any number field, for example, the Sato-Tate result becomes very clean, and is considerably more straightforward to prove. Let be a fixed elliptic curve with CM by . Let be a unramified prime of . If is inert, then (i.e. ). If is split, then is uniform across . I’m told this is much easier to prove than the usual Sato-Tate. Each is double one of the terms! There is no mistake: the are also tied to the decomposition of . And this works for any number field. What’s happening? The main idea is that looking at a prime ideal , is related to the argument of the complex number in some way. Of course, there are lots of questions unanswered (how to pick the sign, and which of and to choose) but there’s a nice way to package all this information, as I’ll explain momentarily. (actually this isn’t quite true actually, some terms change for ramified primes ). which again extends to a meromorphic function on the entire complex plane. for some Hecke Grössencharakter . This is enough to determine the entire since is multiplicative. Thus is a Hecke Grössencharakter for some choice of at each . It turns out furthermore that has frequency , which roughly means that the argument of is related to times the argument of itself. This fact is what explains the mysterious connection between the and the solutions above. With this in mind, I can now frame the main question: suppose we have an interval . What’s the first prime such that ? We’d love to have some analog of Linnik’s Theorem here. I might blog later about what else goes into the proof of this. . . but Deuring’s result is one key ingredient, and a proof of an analogous theorem for non-CM curves would have to be very different.